The Geminid Meteor Shower is forecast to peak late Tuesday/early Wednesday Dec. 13-14, between around 10 p.m. and sunrise, at your local time, in North America. If you can’t stay up that late, not to worry — astronomers tell us that some meteors should be visible as soon as darkness hits. In addition, the shower lasts for days before and after the peak date, and there have already been reports from around the world of people spotting spectacular fireball-like celestial streaks. Now playing overhead: The dramatic Geminid Meteor Shower, which many astronomers agree is the best meteor shower of the year. Following that, stargazers could keep their necks craned for 2010’s only complete lunar eclipse, which coincides with Winter Solstice December 21. The Geminid Meteor Shower is forecast to peak late Mon./early Tues. Dec. 13-14, between around midnight and sunrise, in North America. If you can’t stay up that late, not to worry — astronomers tell us that some meteors should be visible as soon as darkness hits. In addition, the shower lasts for days before and after the peak date, and there have already been reports from around the world of people spotting spectacular fireball-like celestial streaks. Good news! The Geminids should be visible with the naked eye in North America and perhaps in other parts of the world. Sky watchers in cold climates should bundle up, grab a chair (ideally one with some neck support), and perhaps a blanket, head outside where you can see the largest patch of night sky possible (with as little city light as possible), and look up. Because meteor showers last for days before and after the projected peak, be sure to scan the skies during the surrounding days, if you can. This time of year, clouds can obscure the Geminids on the peak day, as can the moon, which will be in its first quarter. This shower has been getting stronger every year it’s been recorded, going back the the 1860s. It could be “an amazing annual display”, according to Bill Cooke of NASA’s Meteoroid Environment Office. This movie of the 2008 Geminids comes from a space camera at the Marshall Space Flight Center. After the Geminids, night-sky gazers can look forward to a full lunar eclipse that will coincide with the winter solstice Dec. 21. A lunar eclipse occurs when the moon passes through a point in its orbit when the Earth is directly between it and the sun, and the moon is in the shadow of the Earth. In the Western Hemisphere, the eclipse will “officially” begin on Dec. 21 at 12:29 a.m. EST (9:29 p.m. PST on Dec. 20). As with the Geminids, the best way to see the eclipse is to hope for clear weather, go outside, and look up. It takes about 45 minutes to notice any changes in the moon’s appearance as the shadow moves slowly across it. The lunar eclipse should be visible in North and South America, the northern and western part of Europe, and a small part of northeast Asia. A complete lunar eclipse won’t happen again in North America until 2014. Space.com has more great information about the lunar eclipse. The last big sky show of the year, indeed the decade, will occur tonight. And some astronomers say it may be the best of the year. Other showers, like the Perseids, tend to get more attention, perhaps because they occur in warm weather for many viewers, but the Geminid show might persuade even reluctant sky watchers to bundle up, grab a chair (ideally one with some neck support), head outside where you can see a patch of night sky, and look up. Scientists believe that the Geminids actually come from an asteroid, called 3200 Phaethon, which is itself an extinct comet. (Most meteor showers come from comets.) Comets create meteor showers by flying close to the sun, which causes the comet’s dirty ice to evaporate and that, in turn, causes comet dust to spew into space. When the comet dust enters the earth’s atmosphere, we see it as meteor flashes. Because asteroids don’t usually produce dust, it is thought that 3200 Phaethon is really the skeleton of an ancient comet. People around the globe have already been reporting seeing good meteor showers. 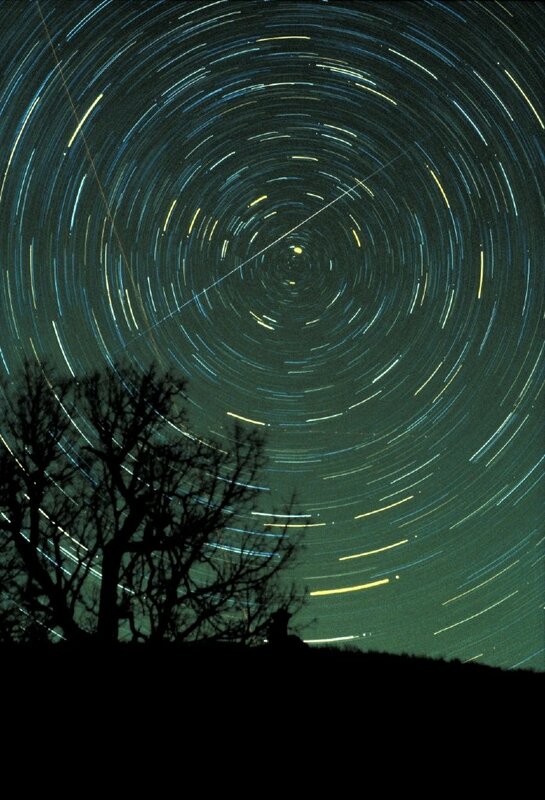 The Geminids are due to peak Sunday, December 13, at about Midnight, Eastern Standard Time. Any time between about 9 p.m. one’s local time and one’s local sunrise the morning of Monday, December 14, should offer good viewing, and there are showers predicted even a couple of days on either end of that. At far Southern latitudes, the viewing window will be a little smaller. This American Meteor Society page is a great site for exploring more about just where and when to find the Geminids in your local night sky. You don’t need any special equipment to view the Geminids. In fact, the naked eye is best for meteor viewing, as it allows you to follow a big swath of the sky. As mentioned before, get comfortable. You do need clear skies, and an area with as little light as possible. If the weather is clear, skies should be pretty dark, because the moon is just two days shy of new. This movie of the 2008 Geminids comes from a space camera at the Marshall Space Flight Center. You can also see the movie here.